Update: This extension is also available as an Alfred 2 workflow. With this AppleScript extension you can convert a string of characters into their ASCII code values and vice versa. 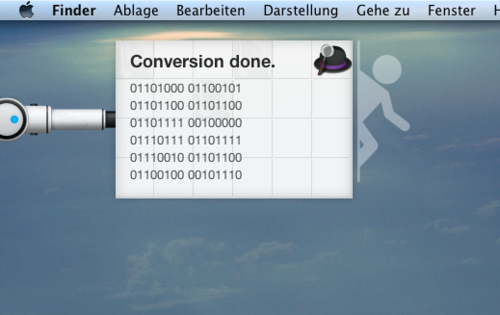 You can convert from and to hexadecimal, binary and decimal. The results will be displayed via Growl and copied to your clipboard. This extension is written in AppleScript and does not require an internet connection to work; the conversion is done inside the script and does not rely on an extern service. It also uses Growl.app to notify you, when the script is done. If you experience any problem with this extension, found a bug or have feature request, hit me on twitter.